Why should you care about linking to a friend’s book? Google. And other search engines. 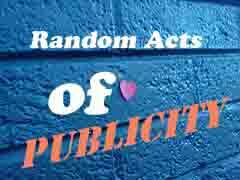 Ever wondered how to get your page to show up on the #1 position on a Google search query? Google takes a number of factors into account when it ranks webpages and how those webpages come up as search results. The top three results for any particular search term garner the most clicks by far. At the very least, you want a webpage to be in the top 30 results, or your chances of clicks are virtually zero. 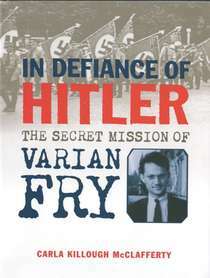 My friend, Carla McClafferty’s most recent book is In Defiance of Hitler: The Secret Mission of Varian Fry. It’s a story about a Harvard-educator American journalist who goes to Nazi-occupied France and helps a thousand Jews escape. If I want to link to her book, the most helpful thing would be to use something like this: Holocaust Rescuer, including Marc Chagall. In other words, the links help in and of themselves. But if you use descriptive words as the text for the link, it helps even more. She doesn’t need help in getting her book found by the title or by her name: she needs help getting it found by someone interested in Holocaust rescuers. Add links to your friend’s book whenever, where ever you can; use keywords as the link text for extra credit. Wikipedia is the internet encyclopedia,which is edited by, well, by you. Put up a Wikipedia page for your friend. Wikipedia won’t allow you to put up one for yourself, but you can put up one for a friend. Be sure to read Wikipedia’s guidelines before doing this, as they are specific about how to add pages. Link to a friend’s webpage or bookstore listing with specific keywords. Please post what you’ve done today. This is incorrect. Wikipedia does not prohibit people from writing about themselves; it merely strongly discourages them. It also strongly discourages people from writing about their friends, family, or their works. It is a grave error to believe that you can advertise yourself, or your friends, on Wikipedia, if you are a non notable person (e.g. a mostly unknown author). Chances are that your article will be deleted, and that a permanent record will be kept that the article was deleted due to its subject being non notable. Because Wikipedia has such high standing with Google, this permanent record may well be the first Google hit for your name, or your friend’s name, reminding everybody that you or your friend is a nobody. In short, steer clear of Wikipedia. Thanks for the response on Wikipedia. I’m sorry you didn’t leave links to the exact pages on Wikipedia which gives the info you reference. My understanding from reading and writing on Wikipedia, is that you are discouraged from writing about yourself. And yes, notable persons should be featured. However, many of the authors who read here ARE notable, or their friends are! They have won many awards in children’s literature and should have pages on Wikipedia. It shouldn’t be done lightly, but don’t feel intimidated, either. Today I linked to a friend’s book, ALEXANDER THE GREAT ROCKS THE WORLD by Vicky Alvear Shecter!